Sustainability education and training will underpin sustainable development into the future. Whether you’re building your career in sustainability, driving corporate change or delivering education curricula in schools, this page provides some resources to get you started. Education and training can have community-wide spin offs. In addition, building skills and knowledge provide benefits to any green initiative by building the capacity and cohesion of teams, enabling organisations to get the most out of building retrofits, embedding effective and efficient reporting systems and establishing ongoing stakeholder engagement processes. Check out our event calendar for sustainable business training opportunities. Currently the Australian Curriculum has four cross-curriculum priorities which include sustainability. The NSW Department of Education and Training was engaged by the Australian Government to develop the Sustainability Curriculum Framework (NSW Government website including a literature review). The framework was released in May 2010 and can also be found here (Australian Government website). 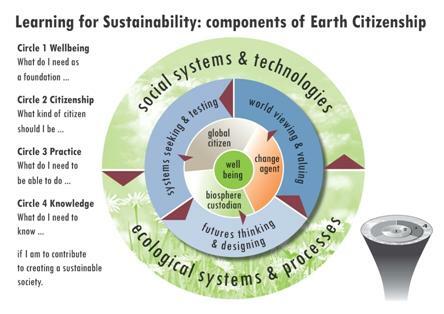 The framework has been informed by an earlier model of ‘Earth Citizenship’ – see below. There have also been a number of state and federal organisations set up to promote and support school-based sustainability education – see below. This 4 minute video shows that even primary schools can go green for cost saving and positive learning experiences with a bit of expertise and processes for engaging the school community. Click here to find out more about how thousands of schools like this one are joining the Green Schools Alliance and making sustainability work in schools. In February 2013, UNESCO released the first free online curriculum package for high school teachers delivering climate change education for sustainable development (CCESD) – it includes powerpoint slides. The Gaia Project, Canada, is an educational charity dedicated to providing project based sustainability education to students which works closely with students, teachers, schools and outside professionals. Centre for Green Schools – driving the transformation of schools towards more sustainable, healthy places to be. 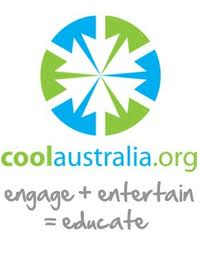 In 2013, an Australian non-profit group, Cool Australia released a series of curriculum tools linked to the national curriculum. Here’s a radio interview with the award-winning founder, Jason Kimberley. ARIES is the Australian Research Institute for Environment and Sustainability based at Macquarie University in NSW. In 2006, ARIES produced this 62 page document entitled ‘Shifting towards sustainability: six insights into successful organisational change for sustainability’. It’s not a step-by-step manual on ‘how to be sustainable’ but inspires readers to look at sustainability using a new way of thinking – an Education for Sustainability approach. Clean Energy Council has a series of resources for teachers and students here. See also our topic pages about consumers and children and young people. The Australian Government has funded the establishment of a website promoting sustainability education in tertiary education institutions. Some of the course content has been shared on the website. This project applied the proven change leadership framework developed in the ALTC’s ‘Learning Leaders in Times of Change’ project to the distinctive area of effective turnaround leadership for sustainability in higher education. The project was undertaken in a collaboration between the University of Western Sydney, the Australian National University, the Sustainable Futures Academy and the University of Gloucestershire. It will produce a validated change leadership framework for building Education for Sustainability (EfS) successfully into the core activities of our universities, as well as a package of leadership development resources for use in individual recruitment, promotion, development and performance management activities. It has also documented a range of successful practice models. This 6 minute film outlines the role of sustainable universities. The film features, one of the foremost experts on the topic, Carol Adams. Stay tuned for a directory of sustainability training providers. La Trobe University has compiled a recommended reading list here. Conference papers from the annual conference of Australian Campuses Towards Sustainability – 2012 papers here. It includes elements of a MSS11 Sustainability Training Package for TAFE including qualifications for business ‘sustainable operations’ and for environmental monitoring and technology. There’s also a link to a Sustainability Community of Practice in New South Wales. Check out our event calendar for other sustainable business training opportunities. Training videos for business sustainability are available through VEA Australia – New Zealand and other providers.